R/Youth is the student movement at Valley West Christian Center. Originally Crossfire Student Ministries, Reality Youth was established to bring students into a real encounter with Jesus Christ by building an intimate relationship with him. Since 1992 the student ministries at VWCC have sent students all over the world, in all avenues of ministry, proclaiming the gospel of Jesus Christ and pulling heaven closer to earth. To equip, empower, and release students to advance the kingdom of heaven. Reality Youth has always been a safe place where students can worship God freely and passionately. We believe that encounters with God are life changing. Whether it’s our times of worship, prayer and intersession, our times in the Word, or just hanging out, students are in a constant atmosphere of love. Our desire is that students come face to face with a God who graciously loves and compassionately forgives. Being Californian’s, this ministry has been spurred by the great gold rush of the 1800’s when thousands flocked to California in search of gold. Our mandate is to pull the gold out of the hearts of students and prepare them to enter their destiny; mold them into men and women of God using the Word of God as our foundation and The Holy Spirit as our guide. We want to see students dreaming with the visions that God had placed in their hearts before they were even born! We want to release students into the business world, the arts, education, full time ministry, medicine and the sciences, politics, and media to just name a few. We believe that the Lord has placed greatness in every person who walks this earth. R/Ministries is a component of several student ministries. 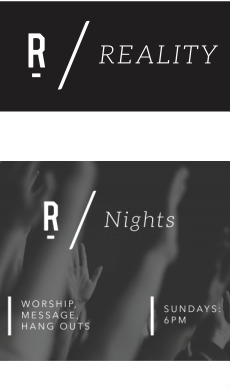 We gather throughout the week with our corporate time of worship SUNDAY NIGHTS 6:30pm called R/Nights. We also have R/Generation meetings that bring together all our student ministries for a night of powerful worship, word and encouragement. We konw that the week can get busy and what better wat to kick off a new week then by worshiping Christ and spending time with friends and family while you do it. Join us each Sunday Night 6pm. We know how cool junior high is, so we created a ministry just for you! Every Wednesday night our JV RY team hosts services designed just for Jr.High Students. JV RY also hosts many events designated for our Jr.High Students and their friends. Which means you should probably be in Jr.High if you're going to check it out. Trust us, it's worth it. The RY team firmly believes that the largest un missioned territory on earth are high schools and junior high schools in America. Each week Campus Awakening ministers to thousands of students and faculty through prayer and power. We partner with other on campus ministries as well as other youth groups to see Christ increase on these campuses and contend for heaven to invade each campus. At RY we know God has called us to disciple and release students into areas of great influence. Pastor Charles & the Reality team have developed "GO Discipleship". GO is a three track discipleship program offered bi-monthly and taught within 5 week intervals. We strongly reccomend you check this out, it's a lot of fun!